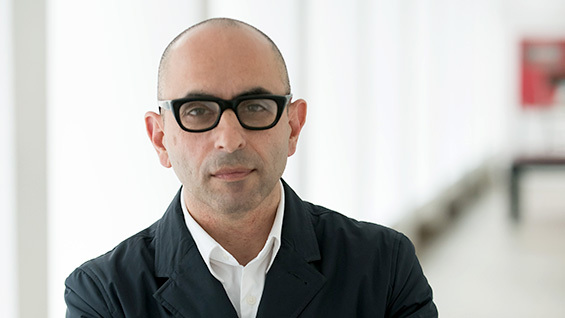 As students of architecture increasingly must think in ways that defy regionalism, there may be no one better suited to shepherd them into forms of globally informed practice than Nader Tehrani, whose personal history and professional work span multiple continents. We spoke with him on the occasion of his one-year anniversary as dean of The Irwin S. Chanin School of Architecture to discuss how it has been going, what goals he has in mind and why he foresees a wider focus for the school, while embracing its site-specific qualities. Nader Tehrani, 53, was born in London. Because his father was a member of the Iranian diplomatic corps, Tehrani spent his childhood in various countries including Switzerland, Pakistan, South Africa, Iran and Italy. Starting at 16 he attended a prep school in the United States, during which time the Iranian revolution overthrew the Shah. His family eventually settled in New England. His developing interest in the visual arts led him to the Rhode Island School of Design, where he majored in architecture. As he built a practice in Boston, first at Office dA, then NADAAA, where he is a founding principal, he also continued his pedagogical work, eventually becoming head of the architecture department at MIT. Then he applied to be dean at The Cooper Union. I live between Boston and New York. But in the climate we will live in today I think it is important to understand that we are citizens of the world. I don't think I would have said it with such clarity even some months ago, but somehow I find the uniqueness of my childhood is no longer that distinguishable from the identities of millions of others whose lives are the result of migration, cross marriages and alternative families that engage with the world in ways that are non-monolithic. How did you come to pursue architecture? As a young boy I had already moved from Iran to Pakistan and then South Africa. In a strange way, without a language or a common cultural history being my foundation, somehow visuality became that language. I also did have an older cousin who was a great artist, and she helped me to read forms, spaces and patterns. At an early age she prompted me to think visually through drawing and representations of all kinds. I don't know when exactly I decided to become an architect, but it became clear in high school that, by intuition, I was not going to apply to just any school or become a doctor or a lawyer. I knew that something in the visual fields was going to be my target. So I focused on Bennington and RISD. I wasn't sure if I was going into film or architecture, but once I set my eyes on RISD the foundation program allowed that process of internalizing the arts as part of a larger discursive field to be able to help me think through what that future might be. You could have focused exclusively on practice. What kept you drawn to academia as well? Being in academia was a direct extension of my experience at RISD, under the tutorship of Rodolfo Machado and later under Jorge Silvetti at the Harvard Graduate School of Design. In many ways the experience they enabled offered a lens into what one can do through academic research, so as to build a relationship between practice and pedagogy. Pedagogy involves giving and taking. And for me it was bringing elements of the world into school but also doing research at school and exporting it back out to practice. And that is something I would like to enable students to do. That's how I started teaching 25 years ago. What interested you most about becoming dean at The Irwin S. Chanin School of Architecture? After years of practice and sometimes doing extraordinary buildings, I am just not interested in any sort of practice. Practice represents a lot of work, a lot of time spent, and sometimes on things that are not worthy. For that reason, being more selective has become more important to me. The idea of being in a school environment where you can genuinely give your time, your intellect and your finances to students who offer a different opportunity for the future is really a commitment that is worthy of my investment. The work becomes worth it if and only if you can define a culture and an ethic behind it all. I think Cooper has the make-up of all those elements. It is small enough that you can see the entire school in one space. It is also large enough that it gives space for diversity of positions and approaches. And the connection of architecture to the arts and engineering, among the humanities of course, also enables a completely different and open-minded approach to how we may redefine the discipline. And for me this is everything you could ask for. So how has your first year gone? It has been going very good for me. The first semester involved a lot of orientation. Meeting the faculty and students. It took a long time, actually. I wish I had the opportunity to join the school a little bit earlier to get a lot of that over with during the summer but it was not possible. The second semester was a real immersive experience because I taught studio and we were getting ready for the NAAB reviews and the end of year preparations for re-envisioning the school. So in many ways this coming year will be my first year. But I have identified a few areas of significant and immediate opportunities, and the students and faculty are helping me give them some energy. Hopefully, this will help lead to other areas of intellectual focus and expansion. One is to tap into the cultural resources we have at the institution at large. What are the ways in which we can expand how architecture can be impacted by engineering, the arts, and humanities and how can we lead the collaborative challenges that address larger social challenges as a result? As the new positions of leadership get appointed in the schools of art and engineering as well as the institution itself, I think we can have a more in-depth conversation about that. More immediately, I have tapped into one of the pedagogical jewels at The Cooper Union: it's third year analysis course, which historically has taken a family of buildings as a resource for analysis and transformation. I have shifted that into a traveling studio where students are not only looking at buildings but also visiting the city in which they are located and getting a series of lectures from local historians, architects, and other thinkers, enabling the students to appreciate the wider social, economic and political forces that form the backdrop of the very buildings they are studying. We are going to Mexico City this year. We can target a different city each year and build up our portfolio of urban tours. The school’s budget already allows for it, if we establish a rigorous accountability of teaching responsibility and units. I have also inaugurated a handful of endowments as a central part of my mission. I want to begin to expand the financial footprint of the program by bringing in alumni to invest in the school. These have started already. We have an endowed lecture currently. I would like to have an endowed research project per year. We will need to build a circle of "friends" that can help us balance out our pedagogical and financial commitments. How have you been working with the faculty? There are many areas we have within our governance to empower the voice of the faculty to impact the direction of the school. I have tried to have a series of round-tables by inviting the faculty, including the adjunct faculty and proportional-time faculty to weigh in on our school of thought as a broader narrative and to re-evaluate our pedagogies from first-year through fifth-year and masters. Those conversations are ongoing and helping to set the agenda for the fall in more specific ways. I think they are important. It is a way for the school to take its own temperature; it's also a way to acknowledge that education is not a static phenomenon. It is a work in progress. This is something we must do every year, all the time, but in communication with each other. This summer, the faculty have achieved a lot across disciplines to bring them into conversation. What will be the impact of the new full-time faculty you have been approved to hire? The impact will be enormous. We currently have three full-time faculty. In another era, we had up to eight. Expanding our full time faculty will enable us to share broader administrative and intellectual responsibilities. For a school that has not seen the level of coordination, communication and collaboration that I would expect, this is going to be a pretty significant transformation for our community. It's a work in progress and we look forward to filling those positions by December. What qualities are you seeking in the new faculty? The way the position was defined was broad enough to bring in people from the realm of building technologies, from history and theory, from computation and other areas of representation. Given the profile of the school and where it is now we would be interested in people with a commitment to practice. Practitioners are few and far among the faculty. We would want individuals who establish a serious commitment between practice, research, pedagogy and service. I understand this is a lot. But this is exactly what an academic practice entails. We are not here to teach alone, but also to contribute culturally on more than one level. The job describes an extraordinary type of person. They may be tenured or non-tenured level. This is an opportunity to imagine a future generation beyond the time when we are here to oversee its leadership. How do you see The Irwin S. Chanin School of Architecture in the context of other architecture schools? One of the wonderful things about The Cooper Union is its size and its ability to develop a school of thought, which in the age of the internet is a very hard thing to achieve. But through the design studio, Cooper offers the opportunity for an immersive experience like no other place. In other words, precisely because the internet allows you to be everywhere all the time, certain sacred spaces become a respite from the digital noise that is out there. So, I see this is an opportunity to create a space of research that produces just enough insularity such that students can produce truly inventive forms of knowledge, while at the same time to study the transformations of design culture in the world out there with a mediated eye. It cannot be done in an environment of noise alone. How would you describe your long-term vision for the school? We are in the city of all cities and surrounded by the most formidable cultural institutions. We can easily adopt the many travelers that pass through NYC to become part of our conversation, to help create a platform for debate and exchange. In the spirit of the Architectural Association of the late '70s, this school could be a space that is a laboratory for testing, thinking and speculating -- and less worried about failure. We are not interested in preparing students for the profession, per se. We are interested in imagining that students can re-envision practice altogether. The redefinition of the profession will require a good bit of speculation, transformation and risk. So I would like to begin to frame an environment where uncertainty is embraced as part of our discussion. What's the last piece of architecture you experienced that moved you? At Tippet Rise Art Center, in Fishtail, Montana, I recently saw the most extraordinary series of installations [see here, here and here] by Antón García-Abril and Débora Mesa [Ensamble Studio, of Spain]. They are undertaking a very interesting combination of concurrent research projects: one invested in the culture of pre-fabrication and optimization, the other in the culture of customization and rarefied construction. It produces work that is strangely anachronistic. It does not belong to the time in which we live. It transcends it. If I could say something about Cooper Union's program and what makes it unique it would be that one word. It is anachronistic in all the best senses. It is not required to be part of this time to be relevant. It allows itself to speak to other times beyond what we experience.